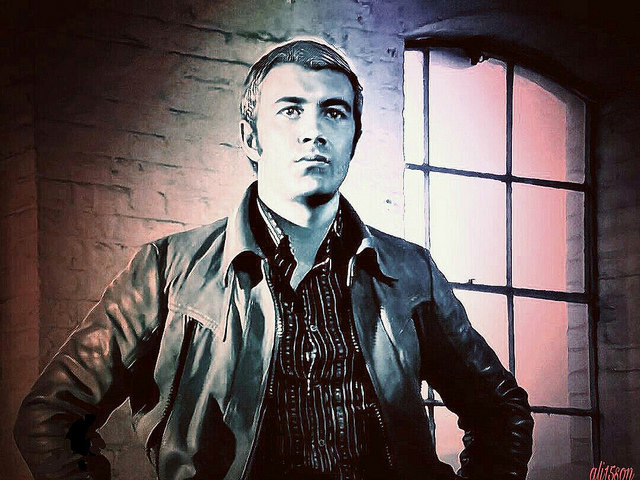 #412....."LEWIS COLLINS" - BODIE 3.7 . you'll never walk alone ! Wow, this is striking and I love the way the details of his jacket have come out in your artwork. Great choice of colours, too. Thanks a lot! awww thankyou, it took some patience to get the shadowing just how i wanted it but hopefully the end product worked. Glad that you like it and thankyou for looking. Wow! Amazing and impressive artwork! You're so creative. Bravo! thankyou so much for your kind words. I'm glad that you like my artwork and thankyou for looking. oh me too, any leather jacket suits this man. I'm glad that you like it and thankyou for looking. Love the effect here - and the subject is pretty nice, too! Thankyou, i certainly enjoyed creatinb it and yes he is ALWAYS. many thanks for looking at it. This is really beautiful and I haven't got to the subject matter ..
awww thankyou so much, i'm glad that it works for you and many thanks for taking a look.